From the 1st May, our helpline will be open 7 days a week. We’ve also recently extended the hours we’re available during the week so now, we’ll now be on-hand to help with your family history queries Monday to Friday, 9am to 10pm, and Saturday and Sunday, 9am to 8pm. Our new e-payments system lets you purchase printouts and images of any of the 22,000 maps on our Maps of Scotland website. It allows much quicker and simpler purchasing for customers, with prompts and helpful notes to guide you through the payment process using a credit/debit card or PayPal. Registered customers can also track the progress of orders, view previous orders, and contact /address information is saved for easier repeat orders. Simply view the map you'd like and click on the order button. Secondly, the NLS Post Office Directories site at http://www.nls.uk/family-history/directories/post-office is now complete with over 700 directories available to consult freely from 1774-1911. The website now offers the same as the Internet Archive, with which it collaborated to scan the volumes, but the NLS is also working on a searchable index for its site which should be available later in the year. We are pleased to tell you that customers can now readily search the 1911 street index by selecting these documents from the search screen. You simply need to select the '1911 street index' and then the town or city. Unfortunately these records do not cover every street that existed in 1911 but they do cover a large number of towns and cities. These documents will help you browse through the 1911 census records because they provide details of the registration district and enumeration district number that cover that particular street. For customers who are not at the Centre, these records can also be accessed at the link below. Tayroots is hosting a Local & Family History Fair at the Inglis Memorial Hall, Edzell, Angus, on 14 May from 10.00am - 4pm. Family history societies including Aberdeen & NE, Tay Valley & Lanarkshire, local museums and history groups, expert lectures about Angus and the Guild of One Name Studies, and storytelling at 11am and 2.30pm for kids by Dundee Storytellers Group - Blether Taygither. Free event - all welcome. A provisional list of talks being considered for the two week long Unlock the Past History & Genealogy Cruise from Auckland to Sydney in November of this year has been placed online at http://www.unlockthepast.com.au/events/history-and-genealogy-cruise-november-2011-scottish-irish-theme/presentation-outlines. Yo urs truly will be one of the speakers on the cruise, and the list includes about ten Scottish topics which I have proposed to talk on, as well as several others on Irish online resources, DNA, British WW1 civilian POWs, writing family history articles, and for a bit of fun in between, possibly even some basic beginners sessions in Scottish Gaelic if the interest is there! I am only part of the team, however, and the full list contains of over a hundred topics currently under consideration from Shauna Hicks, Rosemary Kopittke, Dan Lynch, Jane Gow, Perry McIntyre, Richard Reid and Keith Johnson. My Heritage (www.myheritage.com) has been busy carying out research into British surnames threatened with extinction. Much of the story is covered at http://www.theaustralian.com.au/news/world/some-of-britains-most-colourful-surnames-are-being-lost-through-emigration-and-marriage/story-e6frg6so-1226044938732, but Ruby Soave has kindly been in touch on behalf of the company to provide a Scottish take for readers of this blog. The list of surnames that are on the verge of disappearing/presumed extinct include Bread, Relish, Birdwhistle and Miracle. The late jazz composer and musician Sir John Dankworth has fewer than 20 bearers of the name in the UK today, and his daughter, the singer Jacqui Dankworth) admits that it would be up to her niece to continue the name and uphold her father’s heritage. There are only two examples of the surname MacQuoid in the British electoral records. It seems likely that the name is related to MacQuaid (a name still found in Co Monaghan). The meaning of MacQuoid is obscure, and no authority offers an origin (although in Scotland, the name would appear to be affiliated with the MacKay clan). Loughty is considered as a variation of Lochty, the name of two villages in Tayside (one a couple of miles west of Perth; the other about 6 miles west of Brechin). It is most likely that Loughty, Lochty (also Loughtie) are surnames from a place name. The word 'loch' is, of course, 'a lake or inlet'; and the suffix '-ty' usually signified the diminutive, the implied meaning being 'of, or by a small lake'. MacMicking is just one of at least 40 variants, from MacMeeken and MacMichan to McMeikine and MakMakin. Its meaning is lost in the ancient mists, but its origins seem to go as far back as the first half of the Ninth Century to one Mahun, who led an invasion of Galloway. The coat of arms of the clan shows a naked - from the waist up! - warrior, above a shield clutching an arrow. The clan was (and maybe still is) associated with the county of Ayrshire. Slora seems to have several variations, including Slorra, Slorah, Slorach and Slorrance. There are currently 41 records of Slora, 5 of Slorah and over 200 of Slorach listed in current mainland electoral rolls (which thought to predominate in the Banff and Buchan districts of Scotland). The names are likely to have originated in the Gaelic 'sluagdach' ('leader') and may initially have referred to the clan elder. The names are associated with Clan Davidson. MacCaa has many clan associations; the most prominent being with the Stuarts of Bute, the Clan MacKay, the Clan MacFarlane, the Clan MacDonald and Clan Galloway. The name is a phonetic variation of MacKay, meaning 'son of Aoh (ie the champion)'. Other similar names in the group are MacCaw, MacCay, MacGaw, MacGee and MacKee. There seem to be over 900 holders of the name in the USA. I had not realised this before, but the version of the British Library 19th Century Newspaper Collection available through the National Library of Scotland's online licensed digital collections (https://auth.nls.uk/ldc/) is unfortunately not the complete updated version of the resource, but only the first initial phase of the released records. The Scottish local papers available through this version are the Glasgow Herald, the Caledonian Mercury and the Aberdeen Journal. The Dundee Courier, also available in the second phase of the collection, is not available on the NLS website. If you are registered to use the Mitchell Library's online resources, its version does contain both phases of the released papers, Dundee Courier included. It is worth checking with your local library to see if it too has full access to the collection. The NLS, however, does also provide access to the Times, the Scotsman and the 17th-18th century Burney Collection. The National Records of Scotland, the new body created from the merger of the National Archives of Scotland and the General Register Office for Scotland, has a new website address at www.nrscotland.gov.uk. The new address acts as a gateway portal to the currently available websites for the NAS and the GROS, and will for the moment act as the 'business end' of the organisation, with the currently available help resources on the NAS site, for example, remaining untouched for the foreseeable future. So if you are concerned about bookmarking sites such as the NAS catalogue, there is unlikely to be any change to that for some time - essentially business as usual! Glasnevin Museum in Dublin is holding an exhibition in its Prospect Gallery until August 2011, themed on Life in Ireland in 1911. Access is 6 Euros, including access to all other Glasnevin Museum exhibitions. A combination museum and tour ticket costs 10 Euros. Following on from Ancestry's free access offer to English and Welsh marriage indexes comes another offer on Canadian marriage records, covering some 300 years. Ancestry (www.ancestry.co.uk) is offering free access to its English and Welsh marriage indexes from April 21st - 30th. The records from 1837-1915 are in fact already free to access, but if you have connections in southern Britain between 1916 and 2005 this may help. Note in the small print "Registration is required for access by providing a name and email address". The Lost Cousins website is offering free access until May 2nd. The site works by adding details of relatives in the 1881 census to the database - if you find a connection with someone laying claim to the same household using the search button, you can contact them and share further details. The actress Elisabeth Sladen sadly passed away yesterday. I don't normally do the celebrity worship thing, but she was such a part of my childhood, and of my sons. For those who will miss her as much as myself and other fans, I've written a short tribute on my other blog at http://walkingineternity.blogspot.com/2011/04/tears-for-sarah-jane.html. In addition there were many collections relating to the surnames Biggar, Bird, Cossar, Doig, Dryburgh, Edmondston, Fiddler, Inch, James, Jarvie, Kinloch, Lumbsdale, Oliphant, Robertson, Sandilands, Spence and Trotter. All is not quite lost however - you can still access the website. The Internet Archive has regularly taken 'snapshots' of it from 2003-2009. To access the site visit the WayBack Machine at www.archive.org and type in the web address http://www.scotsfind.org - you will be offered a choice of years to select from (I find 2007 works best). I am not sure if it was updated beyond these cache dates, but even if so, a lot of something is better than none of something at all! The pages can be saved to your computer in PDF format. There is also an article on the Genealogist'a tackling of its new 1911 census collection for England and Wales, via an interview with Mark Bayley, senior web developer, in the latest issue of Family Tree magazine (May 2011). The University of Glasgow Library has announced that it has secured funding from the Friends of Glasgow University Library to digitise a visitors books relating to New Lanark Mills from the 1820s. How this will be made available is as yet not known, bu the timescle for completion is 2011-2012. 55 free to view digitised maps of the Canadian province of Nova Scotia have been placed online by Nova Scotia Archives, dating back to 1613. To tie in with Easter and some big wedding apparently happening soon, some news on a couple of subscription discounts! Origins.net (www.origins.net) and Burke’s Peerage (www.burkespeerage.com) are offering a 20% discount on all subscriptions taken out between 22 April and 30 April. Simply enter the code: Easterwedding11 in the promotional code box on the sign-up pages or on the check-out pages once you have chosen your subscription. The National Archives at Kew has announced it is rejoining the publishing race, by entering into a partnership with Bloomsbury Publishing PLC, which has also acquired TNA's back catalogue of previous publications. As well as many useful book titles the National Archives also used to publish Ancestors magazine (in partnership with Wharncliff Publishing Ltd), before TNA announced a freeze in its publishing activities some months back. Tha Comann Eachdraidh Bhearnaraigh a' lorg rannsachair airson proiseact ùr - "A' tilleadh ar n-eachdraidh dhachaigh". Berneray Historical Society is looking for a researcher for a new project - "Bringing our History Home". This coming Wednesday is the deadline for completing the 2011 census online - though according to the Herald there is no deadline for the paper version bizarrely enough. To date 80% of census forms have been filed - if you don't fill it out, you could face a fine of £1000. The annual conference of the Scottish Association of Family History Societies (SAFHS) will take place on Saturday June 25th 2011 at Adam House, 3 Chambers Street, Edinburgh, EH1 1HR. Hosted by the Scottish Genealogy Society, this year’s theme is “Census, Church and City”, and amongst the speakers will be Richard Hunter (Edinburgh, Its Archives and Inhabitants), Dr. Tristram Clarke (Scottish Episcopal Church Records), Andrew Nicoll (Roman Catholic Records) and the Registrar General for Scotland, Duncan MacNiven (The 1911 Census). The event runs from 09.30 to 16.30 and will be accompanied by a Family History Fair with many societies and vendors in attendance. For more information, and to book a place, see www.scotsgenealogy.com/Conference.aspx. This week sees the 70th anniversary of the first raid of the Belfast Blitz, when the Luftwaffe attacked the city on Easter Tuesday, and attacked my grandparents' house in the process! There's an interesting blog post from the University of Dundee's Archive, Records Management and Museum Services on the treasures of Glamis Castle Archives, including the story of the fake duel that led to an unhappy eight years marriage and eventual imprisonment for the groom. Former members of the Scottish Women’s Land Army and the Women’s Timber Corps are being offered free entry to an exhibition that highlights the vital contribution of both organisations to the nation’s war effort. Land Girls and Lumber Jills will open at the National Museum of Costume at New Abbey, near Dumfries on Friday 1 April. It explores the history of both organisations, which were formed in 1917, active in both World Wars and played a crucial role on the home front. Land girls took on all types of agricultural work from sowing to harvesting and calving to shearing, whilst the Women’s Timber Corps worked in the forests supplying wood for use in everything from railway sleepers to pit props. Some volunteered while others were conscripted, as by 1941 all women under the age of 60, without children under 14, could be called up for essential war work. Visitors to the exhibition can see a selection of colourful wartime recruitment posters, discover the history of the two organisations and learn first-hand about the experiences of three Land Army girls and a Timber Jill. Objects on display will include a Land Army dress uniform and a milking jacket, a selection of working tools and one of the medals recently awarded by the British Government. The objects will be brought to life through the use of personal testimonies and audio recordings. The exhibition was first shown at the National War Museum in Edinburgh in 2010 where it attracted over 500,000 visitors. New elements added for its display at the National Museum of Costume include information about the role of make-up in the war effort and examples of remodelled outfits including a dress made from furnishing fabrics to demonstrate the Make do and Mend culture of the era. Some examples of clothing from the government’s Utility Scheme will also feature. Girls who joined were often very young and away from home for the first time, so they experienced homesickness as well as unfamiliar faces, surroundings and jobs. Many had swapped their town life for the countryside, which was a shock to some but healthy outdoor fun for others. Many marriages forestry colleagues who came from abroad to assist with the war effort. The vital hard work and commitment of these women was publicly recognised in 2008 when they were issued with a medal and a certificate of thanks from Prime Minister Gordon Brown. Land Girls and Lumber Jills at the National Museum of Costume runs from Friday 1 April until Monday 31 October. Former Land Girls and Lumber Jills will receive free entry to the exhibition on production of their recognition medal or certificate. Museum open daily from 1 April to 31 October, 10:00-17:00. There have been two major online releases of military records relating to New Zealand, on FindmyPast (www.findmypast.co.uk) and Ancestry (www.ancestry.co.uk). * Guthrie Index - index of New Zealanders who served with British and other Forces. * Smith Index - from records held at Archives of the Australian War Memorial and the Australian Department of Defence Army Office of New Zealanders who served with the Australian Forces. * Halpin Index - from The National Archives, Kew, re: New Zealanders who served with the Royal Naval Volunteer Reserve. * British Section NZEF - from an undated list held by the National Archives Wellington, those who enlisted in England and embarked for Egypt on 12 December 1914. * Fijian Contingent - soldiers who left Fiji on 5 August 1918 per Talune for the Narrow Neck Camp, Devonport, Auckland. The collection is described as Ireland, Civil Registration Indexes, 1845-1958, but in fact this is extremely misleading, particularly with regard to records from Northern Ireland. Prior to Partition there was one central GRO based in Dublin, but from 1922 a separate GRO was established in Belfast to cater for the six counties of the new statelet of Northern Ireland, with the GRO in Dublin continuing to administer to the rest of the island as before. The Family Search BMD indexes cover the whole of Ireland up to Partition, but afterwards the database contains records predominantly for what became the Irish Free State, and from 1948, the Republic of Ireland. However - I say predominantly. There are in fact some records for the north included in the database after Partition, but even with the wiki update, there is no indication of the extent of this coverage for Northern Ireland on the site - it simply says "Northern Ireland, 1922–present. Physical description not provided at this time". Most Northern Irish birth entries found in the database have a FamilySearch microfilm number but no volume number or page number, as with pre-Partition events. The northern post-1922 marriage records do have these details, as do the deaths. At least the records prior to Partition are complete for the whole island, aren't they? Um, no! But the wiki update does show the gaps in all Ireland coverage prior to 1922 - for births, there are omissions in 1867, 1869, 1880 and 1892-93; for marriages no gaps are noted, and for deaths there are a handful of missing entries for the third quarter of 1894. The registers microfilmed by Family Search can also be ordered up from the Family History Library to consult at your local LDS family history centre (https://familysearch.org/locations). Northern Ireland remains the only part of the United Kingdom of Great Britain and Northern Ireland in the second decade of the 21st century to not have any comprehensive online provision for indexes to its own citizens' civil records for births, marriages and deaths, the most basic genealogical records there can be. To be a devil's advocate though, this may possibly be to save on Ulster's health budget, as Northern Ireland also charges an extortionate heart-stopping rate of £14 plus postage and packing for each certificate, the highest rate by a long mile in the UK. (The day that GRONI takes a few lessons from PRONI or the GROS in Edinburgh will not be a day too soon!) However, it may be worth noting that a CD is available at the ScotlandsPeople Centre containing an index to all Northern Irish births from 1922-1993, located in the Dundas Room. When ordering certificates, bear in mind the following. Certificates for all of Ireland prior to 1922, and for the south afterwards to the present day, can be ordered from the GRO in Roscommon at €10 each via www.groireland.ie but you need to print out the form and fax or post it with your credit card details. However, you can also order a photocopy of an extract for just €4 for genealogical purposes, just a Euro dearer than a transcript on RootsIreland at www.rootsireland.ie (though RootsIreland now offers discounts on multiple births in a family unit to the same parents). If you have northern ancestry, just to clarify, you can order records for the north prior to 1922 from the Republic's GRO, and you won't go bankrupt in the process - €6 inclusive of p&p, as opposed to £14 plus p&p. Records can also be ordered and paid for online through Ireland's Health Service Executive website at www.hse.ie/eng/services/Find_a_Service/bdm/Certificates_ie/ - however, formal certificates can only be ordered at €10, not photocopies of extracts - and this site charges an extra €1 p&p per record. For the north, records from 1922 onwards can only be ordered from the GRO in Belfast at www.nidirect.gov.uk/gro at £14 each plus p&p. You can order records prior to 1922 from Belfast, again at £14 each. But you'd honestly need to be mad to do so. I can get back on most lines to the 17th and 18th century only in my tree, but new fossil evidence from Loch Torridon shows that I still have a wee bit further to go! Life on Earth was believed to have started 500 million years ago. The fossilised remains of wee critters from Wester Ross have now effectively doubled that, to life starting a billion years ago. The full story is at http://www.telegraph.co.uk/earth/earthnews/8277163/Ancient-fossils-from-Scottish-loch-show-life-on-land-began-500-million-years-earlier-than-previously-thought.html. The latest quarterly newsletter of the War Graves Photographic Project is now out, and can be read online at www.twgpp.org/downloads/news/TWGPP_Newsletter_Spring_2011.pdf. RootsIreland (www.rootsireland.ie) has now uploaded 32,000 baptism records for County Monaghan in Ulster, meaning that all of the Ulster counties now have some representation on the database. Further material is promised in due course, though it is not clear whether this will include non-Roman Catholic sources. A new web resource is now online commemorating the Shale Villages of West Lothian, as part of the Almond Valley Trust website, and located at www.almondvalley.co.uk/V_home.htm. It is part of a project run from May 2009 - May 2010 to document the communities created by the shale industry (essentially the mining of oil bearing rock) between 1860 and 1962. There is also a three year Shale Families project currently underway as of last May 2010, but the link to some of the records being digitised for this seems to be down just now. The site has several additional links, including one to the Scottish Shale Oil Industry Collections Survey at http://survey.scottishshale.co.uk/ which provides information on over 8000 items relating to the Scottish shale oil industry as held by museums, libraries and archives in Scotland and further afield. Myles Proudfoot is a Cincinnati based market researcher and genie who has just published the results of a fascinating survey on family history on his Family History 21ster blog at http://familyhistory21ster.blogspot.com/2011/04/results-from-family-history-survey-now.html. 1050 people took part, ranging from complete amateurs to long term professionals. Their only common denominator was a strong leaning to the use of social networks, and with 39% claiming to work for a family history society or organisation in some way. Some of the results are very revealing. For example, the average age of those starting their research is 35.8 years - that's the average age mind - so any pretence that family history is a hobby only pursued by the retired gets slightly knocked on the head! Only 34.9% of respondents were in fact retired. Two thirds of respondents described themselves as addicts, and the average length of time people have pursued their research is just over 18 years. Of the many reasons asked why people started their research, I was heartened to read that only 3.9% answered it was because of a TV programme - I've long been of the opinion that shows such as Who Do You Think You Are were commissioned because of the upsurge in interest in family history, they did not create that interest. Interestingly the main reason, claimed by over 31%, was the continuation of someone else's research, followed by almost 27% of people wishing to preserve the memory of a deceased relative. Two thirds of respondents described themselves as amateurs, and one third do work on their trees every day. Over 87% stated they did their research from home, with a third having never attended a family history society meeting or conference. Just under 80% try to tackle their trees on all fronts at the same time, rather than pursue individual research lines. On the most common sites (bear in mind this is a worldwide survey), 14% of people have used ScotlandsPeople. Ancestry and FamilySearch came first and second, though oddly FindmyPast does not seem to be on the list of offerings there. Three quarters of users subscribe to a commercial family history records site, with just over 40% having paid subscriptions to family history sites. In terms of gaining info on new resources or techniques, the top three methods are books (overwhelmingly), family history conferences and blogs, with one to one instruction and podcasts bringing up the rear. The full survey - all 25 pages! - is available through Myles' site. It has to be remembered that this is a worldwide survey, but let's face it, here in Scotland we're not exactly Ireland when it comes to online accessibility and resources (OK, I know it's getting better! ), so much of this will apply. An interesting snapshot. Ordinarily I welcome comments on my blog, but in this case, can I suggest you read the survey and then make your comments on Myles' blog? He's put a lot of work in, it seems only fair that he should get your comments - and he desperately wants them! The Business Archives Scotland blog has described a new online events diary at www.managingbusinessarchives.co.uk/diary/ on the Managing Business Archives website, which seeks to explore best practice in the preservation of business records. Nothing for Scotland is currently announced for the rest of the year, but there are a few events happening down south. The website has provided a link also on the site to the new Scottish business archives strategy - available in both the news and links section. The Third Australasian Scottish Genealogy Conference takes place this coming weekend, with genealogist Sheena Tait as one of the guest speakers. Sheena has blogged about her forthcoming talks at http://setait.co.uk/round-the-world-in-17-days/ and there are apparently a few seats still available. Thanks to David McNay at the Scottish Military Research Blog for the following discovery. An index to British Military Nurses from 1875 is available at http://www.scarletfinders.co.uk/138.html. It is essentially an index of nurses who have worked in Scottish Women's Hospitals in the First World War. For more information, see David's post at http://scottishmilitary.blogspot.com/2011/04/british-military-nurses-from-1875.html and the link itself. This one's so juicy with genie delight it even makes the onions cry! (Maybe I should leave Brightsolid to do the promotion?! lol) :) It will be £2.50, and available for download in PDF format or readable online. The latest newsletter of the Scottish Association of Family History Societies has been published at www.safhs.org.uk/Documents/bulletin201104.pdf. In his Chairman's report, Bruce Bishop has noted that there has been a slight decline in membership across several societies and drops in product sales, possibly attributed to 'over-exposure' in Homecoming 2009 or possibly the current economic climate. A rather large elephant in the room might also be the increasing availability of resources online, not because the resources are online, but because of the false impression that may exist that everything can be achieved online. If you are currently trying to do your research online, society membership is still extremely useful, with many societies having impressive library facilities and above all, local knowledge. The report also adds a reminder to society members that possession of a membership card does allow you free access to other societies' libraries. Amongst other news, the SAFHS conference on June 25th in Edinburgh is also discussed, and individual societies have added reports on their past year's activities, with some interesting developments. These include the Borders FHS Poor Law project in conjunction with the Scottish Borders Archives and Local History Centre in Hawick, which I've previously commented on as a great resource, and an interesting piece by Alloway and South Ayrshire about consideration of adopting a Creative Commons type approach to the members only area on its website, to facilitate the possible sharing of materials between societies. One other piece of news is that Diane Baptie is retiring from ASGRA after many years as a member. I'm often asked about particular brick walls in research, often on the church records front, and Diane's guide Registers of the Secession Churches in Scotland is of one the most valuable books I have in my library. You can find it for sale through SAFHS (www.safhs.org.uk), and best of luck to her for the future. The British Library is holding a family history day on Saturday 16 April at its state-of-the-art conference centre right next door to Kings Cross St Pancras in London. Come and spend the day listening to lectures from family history experts from The National Archives and the British Library. Enjoy free access to UK family history websites findmypast.co.uk, ScotlandsPeople.gov.uk and Genes Reunited, and get one-to-one help and advice from the experts. FindmyPast Ireland has posted a blog update at http://blog.findmypast.ie/?p=22. In truth, it says little other than the team have been busy hiring new staff and getting their initial datsets ready for launch, but useful to know that things are still happening! It may be worth noting that the new website is in fact a collaboration between FindmyPast/Brightsolid and long standing Dublin based genealogy venture Eneclann (www.eneclann.ie), with several jobs advertisements for marketing executives etc having been placed online in recent weeks describing the partners behind the project. In other words this is not going to be some basic repackaging of FindmyPast UK material, this is instead going to be something quite special. Time to get ever so slightly excited...! A big thanks to Mary Anne Gourley for sending me a copy of her book The Travelling Scotsman: The Life and Times of Paterson Saunders, Senior to review. It is a great read, concerning her great great grandfather Paterson Saunders, born in Dundee in 1810, and educated at United College at St. Andrew’s University. Upon graduation, he travelled to New Granada in South America to trade cotton, but fled the scene after a failed marriage with a woman considerably older than himself. he then made his way to India, where he helped his brother run an indigo business, and soon remarried to a lady called Elizabeth McLean. When the business declined the brothers sought a new opportunity – the gold rush in Victoria, drawing in thousands of immigrants and offering a potentially new market for Indian produced goods. They timed their move badly, arriving as the economy turned, and were later forced to return to India, where Paterson would soon see action in the mutiny of 1857. I've just finished reading Tommy's War, an account of a gentleman living in Glasgow throughout the First World War, and I love biographies about 'ordinary folk' who lived extraordinary lives - this definitely fits in neatly to that category. As well as Mary Anne's biographical research into her Dundonian ancestor, she has also reprinted an account of life in Australia as written by Paterson himself, entitled Two Years in Victoria, within the same publication. The two books between them reveal a great story of Scottish entrepreneurial zeal, and provide fascinating contemporary portraits of both 19th century Australia and India. FindmyPast (www.findmypast.co.uk) has released two new military datasets on its website. These records comprise a transcript of the complete WWI Campaign Medal Rolls to 53,000 officers of all branches of the Royal Navy. Added to the transcript are service details for a large number of officers, particularly those killed in action or died of wounds during WWI. In many cases, post-war deaths and WWII deaths are noted. This is a set of records for 288,526 New Zealand WWI service personnel and reserves. The records are obtained from the following sources: Nominal Rolls, First and Second Division Rolls of the New Zealand Expeditionary Force Reserve, Native Reserve Lists, Military Defaulters List, New Zealanders who served with the Australian Imperial Force, Guthrie Index, Smith Index, Halpin Index, British Section NZEF, Fijian Contingent, Roll Of Honour Section 3 and the Stock Index. Due to essential maintenance being carried out on The National Archives' networks, you may experience intermittent problems ordering and downloading documents from our website on Sunday 10 April between 10:00 and 13:00. We expect a full service to be resumed after this time. Another Scottish 1911 census tip - the two page long enumerators returns can be printed on one A4 page, but can be very difficult to read. The easiest way to print them across two A4 pages is to open the image using Microsoft's Paint tool, and in Page Set Up go to the Scaling box - select Fit To and change the settings to 2 by 1. Print the page now and it will come out in two pages, each carrying one page of the census return! I mentioned this group a few days ago, but here is the website of the Scotland in Argentina group (www.scotlandinargentina.com.ar) which is written bilingually in Spanish and English. Might be of interest! In between writing assignments I am slowly working away through the 1911 Scottish census. The big find for me so far has been the discovery that my grandfather Charles Paton was actually in Scotland as a wee boy at that point, along with his siblings and mother. You will have met Charles before - his photo appears on the Scottish GENES Facebook page and the link to that on the top right of this page! 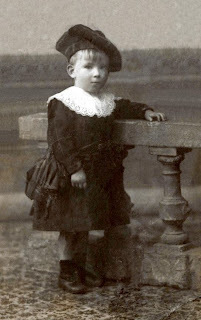 Charles was born in Belgium to Scottish parents in 1905, and I knew he had returned to Scotland for a period before returning to Brussels prior to the war, but had been unclear for how long. Having found that he had briefly stayed in Inverness in 1907 and attended school, and having known from his school register there that he had then moved to Glasgow, I was not sure for how long he had remained in the city, but it now appears he was there for several years. Next stop now (when I can get the chance!) is a visit to the Mitchell Library to try to find school records for him in Glasgow if possible, now that I know where he was living! As expected there was no sign of his father David, who I've already established from Belgian sources was back in Brussels in 1911 managing his shops for Glaswegian firm R & J. Dicks Ltd.
A useful tip before spending credits on ScotlandsPeople is to remember that the National Library of Scotland, in conjunction with the Internet Archive, has digitised over 700 Post Office directories for Scotland - 600 are accessible through the NLS website at www.nls.uk/family-history/directories/post-office, the rest on the Internet Archive directly at www.archive.org. The cut off point for the collection is 1911/12, and so if you are unsure about whether a find on the 1911 search page is that for your man or woman, you could try to find them on the directory first, where extra information such as a trade may help you to narrow down further before committing to the extra 5 credits. Hope you are having as much fun with it as I am! This release now completes the 1911 census for all constituent countries of the United Kingdom. For England and Wales entries see www.1911census.co.uk, and Ancestry and The Genealogist over the next few months, whilst for Ireland visit www.census.nationalarchives.ie. Unlike the rest of the UK, the Scottish household schedules have not survived; instead, the presentation of the records continue as with the previous censuses through the use of enumerators returns, though in this case through two page long returns, instead of the previous one. ScotlandsPeople has advised the results are best printed onto A3 paper if you have that capability – though I suspect most of us don’t! Audrey Collins from the National Archives at Kew has posted about the census on her blog at http://thefamilyrecorder.blogspot.com/2011/04/1911-scotland-england-and-wales-nearly.html, which includes a discussion about aspects of recording criteria for place of birth and naturalisation. 1) You can’t scroll through an entire district in this return (as with previous censuses, at a cost of additional credits), only the enumeration district or institution. 2) There are many references to adopted children in the relationship column- significant as the Adoption Act was not actually passed until 1930. Useful in that it may redefine a member of a household you have previously assumed to be a full-blooded member of the family. 4) If the husband is not present in the house, the fertility census questions on length of marriage, number of children and those still alive will normally not be filled in. In other words, this does not just apply to those widowed. At the same time, a married woman away from the household will still have answers to these fertility questions recorded against her entry. So what was it all about and what were its conclusions?! The Preliminary Report on the 1911 Scottish census can be found on HistPop at http://tinyurl.com/5r6w3cd, whilst the final report, published in 1912, can be found in two parts at http://tinyurl.com/5tcufng (Parts 1-23, City of Edinburgh – Kirkcudbright) and http://tinyurl.com/5ts5qcp (Parts 24-37, Lanark – Wigtown). For an account of how the census recording occurred in Glasgow and surrounding area, read the Glasgow Herald account on Monday April 3rd to discover how Glaswegian suffragettes enjoyed house parties to try to avoid being recorded! The article is at http://news.google.com/newspapers?nid=GGgVawPscysC&dat=19110403&printsec=frontpage&hl=en – see page 9. Although the next census, for 1921, will not be available until 2021, do remember that the National Register, recorded in 1939, is accessible from the National Records of Scotland. This was effectively a census at the start of the Second World War drawn up for the issuing of identity cards and a prospective draft. Entries cost £13 per person, and you will only need to supply the person’s date of death. Unlike the English system, you will receive information only for the person, not the household. Further information on this is available on my previous post at http://scottishancestry.blogspot.com/2010/01/1939-scottish-national-registration.html. Finally – hats off to all the folks responsible at ScotlandsPeople and Brightsolid for getting yet another crucial Scottish resource online. The blog of Australian based venture Unlock the Past has published the results of its latest poll, this time asking which Scottish counties its readers have research interest in. Top of the list were Ayrshire, Lanarkshire and Midlothian, but I was a glad to see Perthshire well represented in fourth place! The Scotland in Argentina (SIA) group, along with locals from the village of Florencio Valera, is fighting to save the 160 year old Scots built St. John's Kirk, which is in dire need of restoration having been almost completely destroyed by fire in 2009. Argentina is increasingly acknowledging the role Scots played in the foundation of the state, and the SIA group believes it has now traced the earliest Scots in the country back to their arrival from Leith aboard the Symmetry in 1825. Recording Sandy on the 1911 census! Meet the original team from the General Register Office for Scotland which handled the 1911 census, under the supervision of the Registrar General for Scotland, James Patten MacDougall (subsequently knighted for his services in 1914), and his Superintendent of Statistics, James C. Dunlop. Thanks to all! You may not be able to meet them in person, but their hard efforts can still be appreciated from 11.00am tomorrow on www.scotlandspeople.gov.uk and at the ScotlandsPeople Centre in Edinburgh (www.scotlandspeoplehub.gov.uk). For the full story behind the recording of the Scottish 1911 census, check out next month's Discover my Past Scotland. Happy hunting - and Alba gu bragh! Although nothing is happening on the Findmypast Ireland website at present (www.findmypast.ie), proof that real live human beings are involved and actively at work can be found on the site's Facebook page at www.facebook.com/findmypast.ie?sk=wall#!/findmypast.ie ! The company also has a Twitter presence at http://twitter.com/#!/findmypastIE, though this is somewhat quieter for the moment. I announced a couple of months back that I have been kindly asked to travel to Toronto to give a series of talks on June 18th at a special Scottish family history workshop organised by the Toronto Branch of the Ontario Genealogical Society (see http://scottishancestry.blogspot.com/2011/02/scottish-research-workshop-in-toronto.html). I'm very much looking forward to it, but can announce that I will now also be giving an additional talk two days before the Scottish event, on Thursday June 16th 2011, on the subject of Irish Records Online. This talk will be held at 7.30pm at Gold Room, North York Memorial Hall, Toronto (Concourse level, opposite the Burgundy Room), and will be split into two parts, each 45 minutes long, with a short break in between. For the first time, TheGenealogist.co.uk Diamond subscribers can access a selection of the 1851 Scottish census records. The results will provide Forename, Surname, Age, Relation, Profession, Birth County, Birth Parish, Area and Street. You can search these records by Name, Age, County, Birth Place and Street. This record set contains approximately 59,000 entries. You'll find these records in the British & International section of your research view. The collection is entitled Partial Scottish Census (1851), but there does not seem to be a breakdown of where the records are from, although there is an option to search in each county. I suspect this is therefore taken from the 1851 census 2% extract which was released on CD a few years back. If so, you have a one in fifty chance of finding your family, nevertheless if you have a subscription to the site, and your family is one of those included, happy days! The site also carries many overseas GRO indexes, which although must be ordered from Southport in England, do incldue events for British citizens from across the UK. My latest book, Tracing Your Family History on the Internet, is now available from Gould Genealogy in Australia, priced at $32.95. Gould is the parent company behind the Unlock the Past venture down under - and I have another book on its way exclusively written for them on Scottish church records, detailing the history of the Kirk, non-conformist and other faiths, and all importantly the records they generated and where (and how) to find them. The latest issue of Discover my Past Scotland (now established for some two and a half years) is available for download or to read online at http://www.discovermypast.co.uk/. Water, water everywhere – but none for our forebears! Housework, the hard way – great-granny’s work was never done! Still only £2.50, and enough Scottish content to make a grown man weep! Thanks to the RCAHMS and Kirsty Wilkinson for the following, via Twitter. Following last year's inclusion of five Edinburgh graveyards onto the World Monuments Fund watch list, it looks like the city has been shamed into doing something about it, in the form of a new collaborative project commissioned to oversee their preservation. The cemeteries are Greyfriars, Old and New Calton, Canongate and St Cuthbert’s. Following news that the 1911 Scottish census is to be released on April 5th comes the exciting news that the 1921 Scottish census is to be released also. The census returns, recorded in the country in the aftermath of the First World War, will show a much depleted male population. The award for its digitisation has not yet been announced as the process is still to be the subject to a tender process, as with the 1911 returns. The ScotlandsPeople Centre and the Brightsolid run ScotlandsPeople website have both upped their prices as of today. For access to the centre (www.scotlandspeoplehub.gov.uk) you will now be required to pay £15 access fee, up from the previous £10, though still less than the £17 paid for the earlier research set up at the GROS. For thirty credits on the ScotlandsPeople website (www.scotlandspeople.gov.uk) you will now pay £7, instead of £6. This equates to a cost per credit of 23.3p from April, up from the previous 20p. A search costs one credit to see a detailed index entry for a record, whilst a digitised image view will now cost £1.17, up from the previous £1. An official certified certificate copy is now £12 if ordered through the ScotlandsPeople website, though £10 if obtained in person at the centre. The NAS and GROS are dead - long live the NRS! Today the new National Records of Scotland has come into existence, the result of a merger between the National Archives of Scotland (previously the Scottish Records Office) and the General Register Office for Scotland. There is no timescale as to when the new website might kick in, but undoubtedly when it does we will have to re-bookmark certain sites such as the NAS and NRAS catalogues, and various records guides, so keep an eye out here for news of the new site when it arrives. For the moment though, stick with www.nas.gov.uk and www.gro-scotland.gov.uk ! David McNay has posted a story on the Scottish Military Research Blog that the Kings Own Scottish Borderers Museum at Berwick Barracks is set to close at weekends over the summer, following a decision by English Heritage to revise its opening hours. An exhibition describing the work of the Land Girls and Women's Timber Corps during the two world wars is underway at the National Museum of Costume in Dumfries.